Twenty-two years ago, Master Hueiguang initiated the IBS Prison Program at Calipatria State Prison. Since that time, the program has continued without interruption. When conditions are right, things naturally go well. We offer our thanks to Shirley and Danny Tam for carrying out the program all these years. Without their hard work and dedication it would not still be continuing. I am delighted to share that IBS is now visiting 22 California prisons on a regular basis. Over the past few days, Master Hueiguang, Ven. Hueiyung from Malaysia, and I have been visiting several prisons in Northern California. All the brothers were so happy, it is hard to express in words how pleased they were to see Master and Venerable. IBS would like to thank Sabrina Lynch-Aguiniga, the Community Resource Manager at Wasco State Prison, for arranging a photographer for the special Wasco visit. We hope these pictures illustrate what happens during our visits. We know that many of our supporters are curious to see what we do in the prisons. This morning at Wasco State Prison, Ven Hueiyung first led the chanting in Chinese. 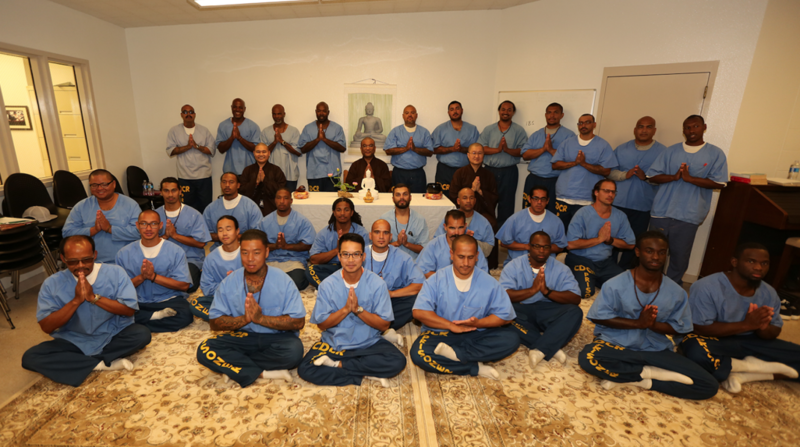 After that, I introduced Master and Venerable to the prison Sangha. Then Master Hueigung gave a Dharma talk on basic Buddhism. Many brothers raised questions that Master answered one by one. They were filled with joy receiving the teaching from Master. I would like to thank all of our sponsors and volunteers for supporting the IBS Prison Program. Each supporter is important for sustaining this meaningful program. Some are supporting with gifts of funding or materials, some are volunteering, and some are participating in the visits; all our helping the brothers, who have lost direction in their lives. Through this program we are restoring their hope and showing them the right way to live. With the blessing of Buddha Dharma, they will be responsible, compassionate people when they rejoin society. May Buddha bless everyone. Amituofo.